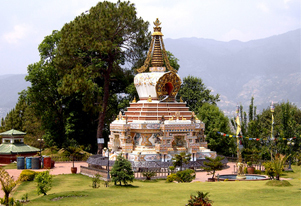 A spiritual 10 days and 9 nights package, especially designed for all those who want to discover the prominent Buddhist places of North India and captivating Nepal. 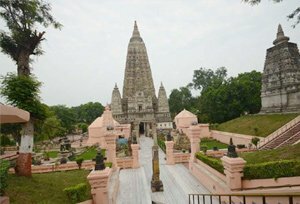 Marvel some of the beautiful places like Bodhgaya, Varanasi, Kushinagar, Lumbini and Kathmandu that have their own significance associated with the life of Lord Buddha. 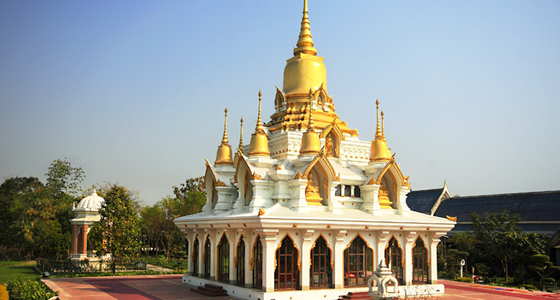 Be it the Mahabodhi Temple or Mahaparinirvana Temple of Kushinagar, the sacred Buddha tour provides a deep insight into the rich legacy of Buddhism in India and Nepal. We at Tour My India leave no stone unturned to make your journey comfortable by taking care of all requirements from accommodation to commutation, thereby leaving you stress-free and happy. Upon arrival at Delhi International airport meet with our representative at the airport arrival lounge. After meet and greet at airport transfer to the hotel. Dinner and overnight stay in Delhi. Today we will go for a full day guided city sightseeing tour of Old and New Delhi. First we will visit Old Delhi, the 17th century walled city of Shah Jahanabad, Visiting the great Jama Masjid built in the year 1656 AD by the Mughal Emperor Shah Jahan, it is the largest & best known mosque in India. Later we walk down or take a rickshaw ride through Chandni Chowk, the old marketplace of Shah Jahanabad now a picturesque bazaar to reach Red Fort, built in the year 1648 by Shah Jahan. In the afternoon visit New Delhi, we will visit Raj Ghat, memorial to the Father of the Nation, Mahatma Gandhi. It is a simple black marble platform that marks the spot of his cremation on 31 January 1948. Further we drive past India Gate, memorial built in the year 1931 to commemorate the Indian soldiers who died in the World War I & the Afghan Wars. The names of the soldiers who died in these wars are inscribed on the walls. President's House, the official residence of the President of India, built in the year 1931. Until 1950 it was known as Viceroy's House & served as the residence of the Governor-General of British India. 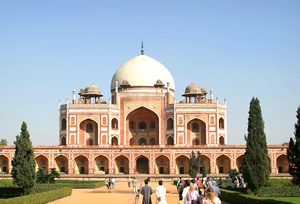 We will also visit Humayun's Tomb, memorial of Mughal Emperor Humayun, built in the year 1562. The complex is a World Heritage Site & the first example of this type of Mughal architecture in India. Qutub Minar, built in the year 1206 by Qutub-ud-din Aibek. It is the tallest (72m) brick minaret in the world, an important example of Indo-Islamic Architecture. In the evening return to hotel for dinner and overnight stay. After breakfast transfer to the airport to board the flight for Patna. Upon arrival at Patna airport meet with our representative and leave for Bodhgaya. On our way to Bodhgaya we will visit the ruins of Nalanda University in Nalanda. Further continue drive to Bodhgaya. Upon arrival transfer to the hotel. Dinner and overnight stay in Bodhgaya. and lots of other significant temples. The Mahabodhi temple built on the east of the sacred tree stands majestically 17 feet high on a base 5 feet square, and consists of a soaring pyramidal tower surmounted by a stupa. The Vajrasana or Diamond Throne lying between the Bodhi Tree and the temple marks the actual spot where Buddha sat in meditation and attained supreme knowledge. A gilded Buddha smiles upon the visitors from a niche in the wall of the temple, and his footsteps carved in stone hold flower offerings from the devout. Unbelievable peace pervades the atmosphere giving credence to legend Besides the Mahabodhi temple, we would visit several Buddhist temples built by the followers of Buddhism from all over the world. Later in the afternoon leave for Varanasi. Upon reaching transfer to the hotel. Dinner and overnight stay at hotel. Morning boat cruise at the river Ganges to observe the way of life of pilgrims by the Ghats. Later we will have an excursion to Sarnath. It enjoys the extraordinary privilege of Lord Buddha delivering his first sermon after attaining enlightenment 2500 years ago. It is about 10 km from Varanasi and holds a number of Buddhist sites that include the famous Dhamekh Stupa, the seat of the holy 'Buddha'. You can also visit the ruins of Dharmarajika Stupa and Mulagandhakuti Temple, where Lord Buddha is said to have rested and meditated while in Sarnath. The Ashoka Pillar built by the emperor Ashoka is a must see in Sarnath. The Lion Capital on top of this pillar is now the National Emblem of India and stands apart for its excellent artistry and carvings. Today we will leave for Kushinagar, (the place where Lord Buddha had left the world behind him after offering an invaluable contribution to humanity, the great religion known as Buddhism). On arrival at Kushinagar, transfer to the hotel. After fresh-n-up we will visit the Mahaparinirvana Temple (where Buddha took his last breathe) and Rambhar Stupa (cremation site of Lord Buddha). Later return to hotel for dinner and overnight stay. Morning transfer to the Indo-Nepal border, from where you will be receive by our Nepal counterpart. Upon arrival at Border meet with our Nepali people and drive to Lumbini - the birthplace of Lord Buddha. The birthplace of Lord Buddha where he known as Gautam in his childhood, Lumbini is situated in the southern Terai plains of Nepal. Lumbini is also a World Heritage Monument of UNESCO. Upon arrival at Lumbini transfer to the hotel. After fresh-n-up city we will visit the Ashoka Pillar. It was built in the year 259BC, by King Ashoka of India. When he constructed this pillar, the King exempted the villagers from paying tax and gave out 100 golden coins to the people. In the 07th century, the pillar was struck by lightning and split into two parts. The site was lost for six centuries and covered with dense forest before being re-found in 1895. In the evening have a walk through monasteries made by many nationals. Dinner and overnight stay hotel. Today we will leave for the Kathmandu the capital city of Kathmandu. The city is the conjecture to the major routes within and outside the country. The city itself is home to the historical monuments, cultural groups, architectural wonders and exotic tourist destinations. Upon reaching at Kathmandu transfer to the hotel. Dinner and overnight stay at hotel. After breakfast we will go for an excursion to Patan to visit its Kopan Monastery:- Kopan Monastery is a thriving monastery of 360 monks, mainly from Nepal and Tibet. Kopan has become especially famous for teaching Buddhism to visiting western people. Patan Excursion: Patan Durbar Square: The Patan Durbar Square has been acclaimed as one of the finest urban streetscapes in the world. Most of the monuments seen today were built between the 16th – 18th centuries. The Patan Durbar Square has been acclaimed as one of the finest urban streetscapes in the world. It is known as the centre of fine arts and for the superb craftsmanship of its artisans. Essentially a Buddhist city, historic inscriptions establish Patan as an important town as it is said to have been founded by Emperor Ashoka in the 3rd century B.C., although no historical proof exists. Later return to Kathmandu to visit the Pashupatinath Temple, Dedicated to Lord Shiva it is one of the most sacred Hindu shrines in the world. It lies 5 km. east of Kathmandu Valley on the bank of the sacred Bagmati River. Thousands of pilgrims visit this temple every year during Shivaratri, the birthday of Lord Shiva. Entrance to the temple precinct is forbidden to non-Hindus. The Large, gilded triple-roofed temple was built in 1696 A.D. though 300 years earlier this was a structure on this site. We will also visit the Boudhanath Stupa:- This is the largest stupa in Nepal and one of the largest in the world located east of the valley. It was built by the Lichchhavi King Mana Dev in the 5th century A.D. The Rinpoches who reside here have established Boudhanath as one of the most flourishing centres of Tibetan Buddhism in the world. The colossal ancient stupa is 36 metres high. Later in the evening return to hotel for dinner and overnight stay.